From our self branded range, this Gompels Wax Free Polish comes in a large and economical pack of 6. Leaving a professional finish that cleans and shines in a single wipe, this wax-free polish boasts a silicone based formula that effectively removed dust and finger marks. Also effective against oil, grease and nicotine stains, this polish is suitable for use on a wide range of surfaces including acrylics, plastics, laminates, chrome, ceramic finished and interior glass surfaces. Provided in a handy spray nozzle bottle which distributes the polish evenly over your chosen surface, this multipack is suited to both replenishment stock or replacement of your existing branded product. 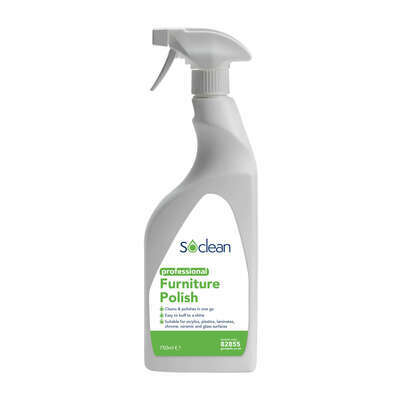 Our Wax Polishes can also be purchase in single 750ml bottle for smaller environments while we also stock alternative branded Furniture Polish and Microfibre Dusters at exceptional wholesale prices.